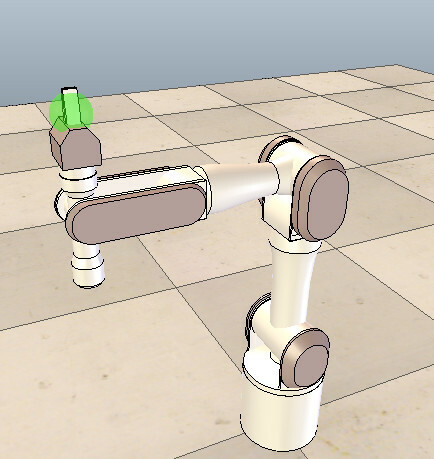 Our department is acquiring a robotic grasping platform similar to the one illustrated above. 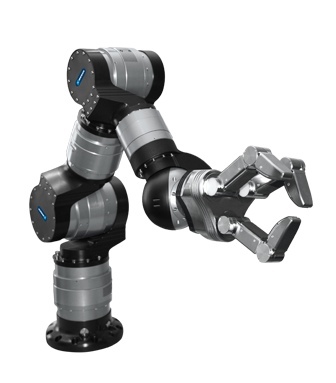 The robot is composed of an industrial robotic arm, a three-finger gripper, and a wrist-mounted force-torque sensor. The aim of this thesis is to conceive a collision-detection mechanism, that stops the robot when it comes in contact with the floor, a wall, or an obstacle. Collisions will be detected by interpreting the measurements made by the force-torque sensor. The key aspect of this work will be the conception of an inertial model of the gripper. The gripper's mass is about 2.4kg. In order to properly detect forces that result from a collision, it is necessary to model the forces that result from the gripper's weight, or from its acceleration under arm movements. The aim of this thesis is to create a model of our robotic grasping platform (arm+gripper) to allow us to simulate it in the simulator V-REP. The key aspect of this work will be the conception of a model of the robot, and the definition of its kinematic chain. The student will convert CAD models provided by the manufacturers to a format handled by V-REP, and parametrize the axes, ranges, and applicable torques of each joint of the arm and the under-actuated three-finger hand. An important part of the project will consist in characterizing the accuracy of the simulated platform, by comparing it to the real robot.